01/13/2019 - The Hershey Bears completed a home-and-home sweep over the Lehigh Valley Phantoms in a 5-4 win at Giant Center on Sunday night. Brian Pinho scored an insurance marker in the third period which turned into his first professional game-winning goal. Both teams jumped out of the starting gate with a combined five goals in the opening period. The Bears chased Phantoms goaltender Branden Komm from the game after scoring three times on four shots within 6:36. Nathan Walker started the scoring for the Chocolate and White only 37 seconds in after redirecting a Joey Leach shot from the center point. Leach's assist marked his first point of the season in his 11th game with the Bears. Only 42 seconds later, the Bears doubled their advantage to 2-0 on another redirection from in close. Liam O'Brien tipped a Riley Barber shot from a sharp angle at 1:19. Barber's helper extended his current point streak to five games. Taylor Leier returned to the lineup for Lehigh Valley after missing last night's game, and cut the Phantoms deficit to 2-1 at 3:39. Leier threw the puck on goal from an angle and received a fortunate bounce off the inside of Vitek Vanecek's leg pad and into the net. Mike Sgarbossa officially chased Komm from the game with a wrist shot at 6:36 for his 17th goal of the season. Before the period expired, Leier once again brought Lehigh Valley within one goal after scoring on the power play for his second of the night at 14:13. Shots after 20 minutes were 12-9 Phantoms with the Bears in front, 3-2. Next period, Lehigh Valley pulled even, but the Bears grabbed a 4-3 lead before second intermission. Connor Bunnman tied the score at 3-3 after directing a back door pass from Nic Aube-Kubel into an open net at the 3:48 mark. At 14:29, Connor Hobbs finished a crisp one-time pass from Juuso Ikonen for his second goal of the season at 14:29. Hobbs' goal gave the Bears a 4-3 advantage, and Lyon became the goaltender of record on the short end. Shots after 40 minutes were 19-17 Phantoms. Into the third period, Pinho hit pay-dirt from the low-slot after Lyon dropped an initial shot from Hobbs at 1:53. Hershey's 5-3 lead held until the final minutes, when Lehigh Valley elected to pull Lyon for the extra attacker. Mike Vecchione scored at 18:34 to pull the Phantoms within 5-4, but the Bears held on successfully. Final shots on goal were 27-24 Phantoms. Hershey improves their record to 17-20-0-2 on the season following a 2-1-0-0 weekend. 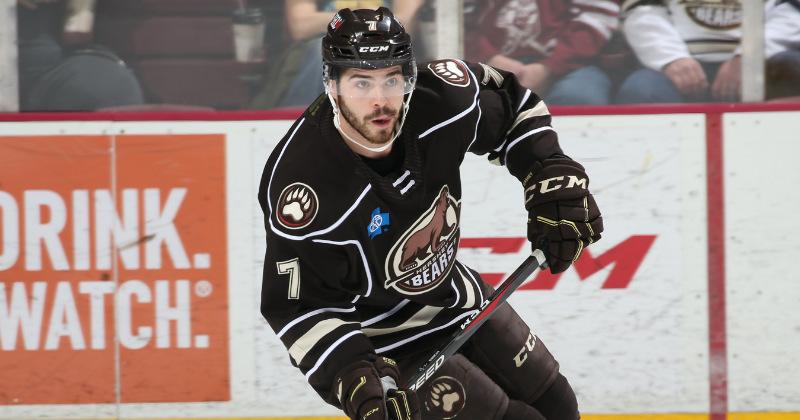 The Hershey Bears return to the ice on Wednesday, January 16 with a 7:05 p.m. tilt against the Binghamton Devils. It's the Bears lone visit to Binghamton this season. Voice of the Bears Zack Fisch will have the call on the Bears Radio Network.